Steel Wood Industries has unveiled a key solution in green building materials during the recent Future Cities Show at Dubai World Trade Centre. Manufactured in the UAE under the name Gusolid-PCS (precast-steel wood), the 100 per cent recycled/sustainable wood replaces concrete as the core building material and can be used to construct building structures. Until yesterday, the concept of creating 100 per cent green and sustainable structures was not considered possible, says the company in a statement. However, once Gusolid-PCS becomes widely used on a global scale, it can help in cutting down carbon dioxide emissions and reduce global warming, it said. Furthermore, the technical specifications and the physical properties of this new material returned all off the charts through third-party independent lab testing, the company said. Weighing exactly one-third compared to that of ordinary concrete and scaling by far higher in strength, Gusolid-PCS is the ideal choice for future green building materials even for record-breaking high towers, according to the statement. In addition, Gusolid-PCS has elastic characteristics acting as a natural shock absorber during earthquakes or heavy wind streams retaining its original form once the extra pressure is negated. Being a pre-cast material, Gusolid-PCS allows architects to cut down the construction time to a minimum considering that the progress of the project depends on how fast the pre-cast parts are produced and simply assembled rather than cast on site. Besides being a pre-casted wooden material, Gusolid-PCS opens the door to more creative designs with further limits unlocked which previously where out question. 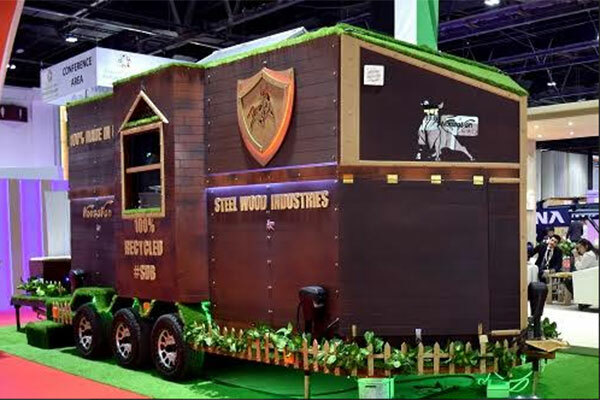 To showcase its effectiveness, Steel Wood Industries has built a prototype of a caravan made of Gusolid-PCS and displayed it at its stand. The vehicle is branded as NousaVan-X (NV-X) inspired by the Finnish word “Nousevan” which means “The Emerging” and X as the Roman numeral for 10 sq m area.